Abuja, Nigeria. July 23, 2013 -The series of Power Sector Polls conducted by NOI Polls Limited in the second quarter of 2013 has revealed that an average of 47% of Nigerian adults said that electricity supply was poor or went from bad to worse. The results also indicate that about 8 in 10 of those interviewed (81%) generate their own power supply through alternative sources to compensate for irregular power supply; while a combined average of 69% have experienced increase in their spending on alternative power supply compared to a year ago. These are some of the key findings from the power sector polls for the 2nd quarter (Q2) of 2013. The Electric Power Sector Reform Act (EPSRA), passed in 2005, initiated the unbundling of government’s power plants under the Nigerian Electricity Power Authority (NEPA). They were formed into business units and regulated by the Nigerian Electricity Regulation Commission (NERC) thus paving the way for public-private partnership and consequently the privatization of the power sector. The privatization process is still underway and is intended to revive the power sector and invariably the Nigerian economy, as homes and industries alike will receive adequate and consistent quality of power supply. 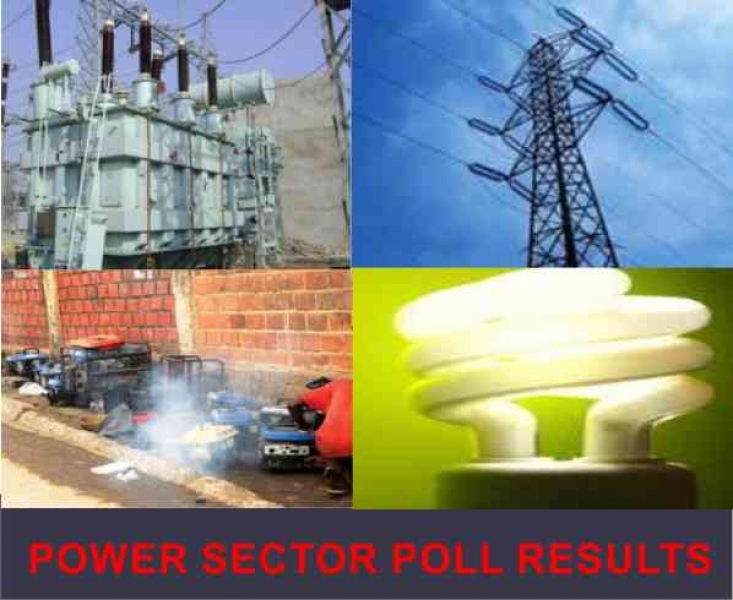 In order to ascertain the perceptions of Nigerians regarding the power sector reforms, the hours of power supply received daily and expenditure on alternative sources of power compared to a year ago, NOI Polls introduced thePower Sector Polls Project in April 2013 to monitor these trends and will release quarterly reports on findings of the polls. This result release marks the first in the series. Over 3000 phone owning Nigerian adults aged 18 years and above were interviewed across this three month period (April-June) and some of their responses to the poll will be analysed in this report. In order to measure the level of power supply to households, respondents were asked: How would you describe power supply in your area in the past 1 month? : A combined average of 47% said power supply had either remained bad (25%) or had worsened (22%); compared with about 33% who said they witnessed some slight improvement, and 20% who experienced no difference in the past month. Nonetheless, it is worth pointing that the poll results indicate a 1-point increase between April and June (April: 31, June: 32) of respondents who saw some improvement, a 5-point drop in respondents who said it remains bad (April: 27, June: 22) and a 3-point increase in those who said it remained the same (April: 18, June: 21). The polls have indicated a link between power supply and the president’s approval rating; as it was observed that in the months where respondents perceived that power improved, the president’s rating seemed to increase and vice versa. The month of May had the best power supply of the three months. Figure 1 illustrates the three month trend. The next question sought to measure the typical number of hours of continuous power supply experienced in the household on a daily basis: On the average, how many hours of continuous power supply does your household experience daily? Averages across three months show that between April and June 42% of respondents claimed to experience about 1-4 hours of power supply on a typical day. 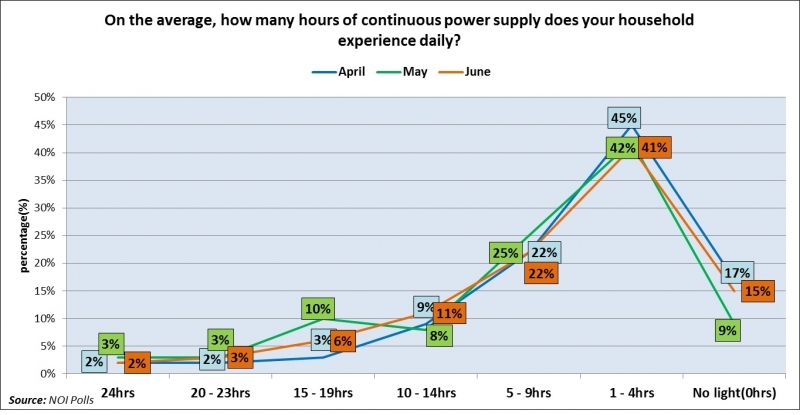 There marks a 4-point decline in the proportion of respondents who received 1-4 hours of continuous power between April and June (April: 45%, June: 41%); a 7-point increase in respondents who received 15-19 hours of power (April: 3%, June 10%); and also a 2-point increase in respondents who received 10-14 hours of power (April: 9%, June: 11%). However, corroborating the findings above, the month of May appeared to have had the highest level of power supply with 10% of respondents saying they received 15-19 hours of power supply, which dropped by 4-points in June. Also, 25% said they received 5-9 hours of power supply, which also dropped by 3-points in June. Equally in May, 9% of respondents (the lowest for the 3 months) claimed to have received no power at all. Therefore it can be concluded that power supply slightly dipped between May and June. Figure 2 shows this trend analysis. Moving forward, in order to ascertain the proportion of Nigerians that use alternative sources of power supply, respondents were asked: Do you use any alternate source of electricity supply such as generators or inverters? Findings show that between April and June an average of 81% of Nigerian adults (8 in 10 Nigerian adults) use other sources of electricity apart from the power supplied to households by PHCN. These ties in with the petrol pump price monitoring polls conducted by NOI Polls that revealed that Nigerians mainly use petrol for their generators. The findings indicate that in May, there was a 5-point drop in the number of Nigerians that used alternative sources of power supply. However, when analyzed across the 3 months, there was actually a 3 point increase. The proportion of Nigerians that used alternative sources experienced a 5-point decline between April (82%) and May (77%) and an 8-point increase between May and June (85%). 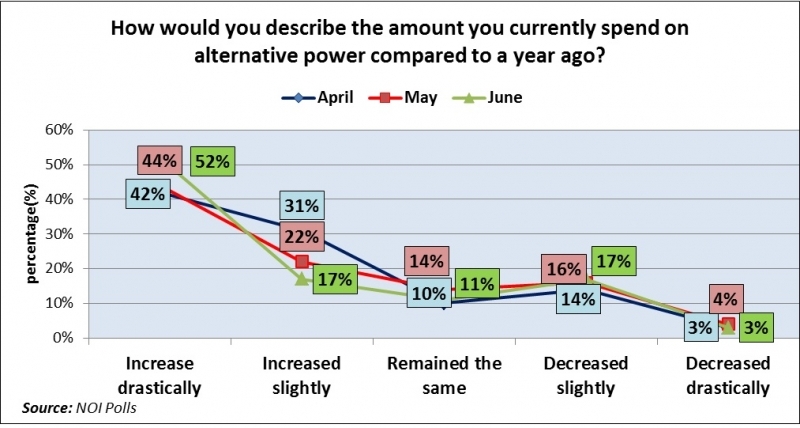 This shows that because power was relatively better in May, less people needed to use alternatives to generate power. Figure 3 illustrates this finding. In order to gauge the spending trend of Nigerians on alternative power sources, respondents were asked: How would you describe the amount you currently spend on alternative power compared to a year ago? Averages over the three month period show that 46% of Nigerians, forming the majority, experienced a drastic increase in their spending on alternative sources compared to a year ago.This is followed by 23% that experienced a slight increase, and 15% that indicated a slight decrease in their spending. While 12% of the respondents did not experience any change at all in their spending, an average of 3% claimed that their spending on alternative sources of power decreased drastically in comparison to the previous year. In essence, a combined average of 69% experienced some form of increase in their spending on alternative sources of power sources. A comparison of the findings of the three months shows the following: a 10 point increase in respondents who saw a drastic increase between April and June (April: 42%, June: 52%) and a 24 point drop in respondents who saw a slight increase in spending between April and June (April 31%, June: 17%). The findings show that May had the highest percentage with 14% of respondents across the three months whose spending remained the same, tying into the previous findings that reveal that May had improved power across the three months. Figure 4 shows the three month trend of the responses on spending. To ascertain the level of awareness of respondents on the reformation of the power sector by the Nigerian government, respondents were asked: Are you aware that the Federal Government is making efforts to reform the power sector? The findings show that an average of 64% of Nigerian adults are aware of the power sector reforms, while 36% of Nigerians are unaware. The month of June with 75% had the highest level of awareness. The high percentage of Nigerians who are unaware of the reforms signifies an insufficiency in the level of publicity of the power sector reforms. Figure 5 illustrates the findings. Finally in order to gain further insight into the perception of Nigerians regarding the on-going power sector reforms, respondents were asked: How do you feel about these on-going power reforms? Responses reveal that an average of about 53% of Nigerian adults are hopeful about the reforms and they form the majority. Tying into the earlier mentioned finding of power supply being better in May, the findings indicate that in May, the highest percentage (64%) of Nigerians were hopeful, showing a link between power supply and faith in the government. On the flipside, a combined average of about 17% of Nigerians dissatisfied with the power sector reforms so far; while an average of 20% are indifferent, and can sway either way, depending on the success of the reform efforts and whether it translates into steady power supply or not. Results from the power sector polls show that in the second quarter of 2013, power supply was highest in May and a majority of Nigerians have experienced a drastic increase in cost of alternative power supply compared to a year ago. The polls further indicate that Nigerians are somewhat hopeful that the on-going reform in the power sector will succeed and translate to steady power supply. In subsequent months and by the end of the year, there will be more information on the trend of power supply in Nigeria and also perceptions on the power sector reforms. The opinion poll was conducted between April and June 2013. It involved telephone interviews of a random nationwide sample of over 3,000 phone-owning Nigerians aged 18 years and above, representing the six geopolitical zones in the country. With a sample of this size, we can say with 95% confidence that the results obtained are statistically precise - within a range of plus or minus 3%.